Here we are back with a new deal for you. 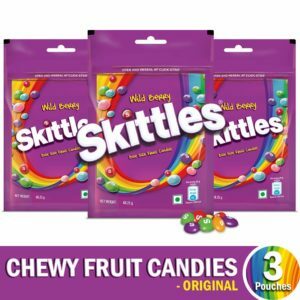 Amazon is selling Skittles Bite-Size Fruit Candies Pouch, Wild Berry Pouch, 204 g with Skittles Pouch, Pack of 3 for Rs 180 only. So, grab this awesome deal now, before it goes out of stock. How to buy Skittles Bite-Size Fruit Candies Pouch, Wild Berry Pouch, 204 g with Skittles Pouch, Pack of 3 from Amazon?